AVCR8TEUR'S PHOTO BLOG: What's up with this? 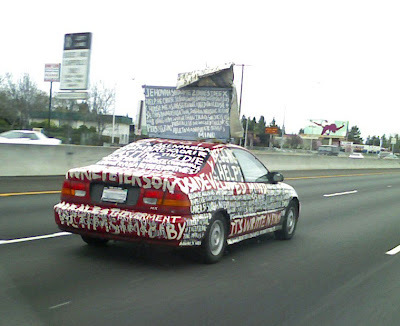 I saw this car the other day while I was on the freeway and I just had to take a picture of it with my cell phone. What was this guy thinking graffiting his own car? Would you drive this car? It's definately making a statement. That statement being: "Look at me! Look at me!". It makes me wonder what goes on in a person's head. Honestly, what would possess them to do this to their vehicle? That must have been one bad paint job, is what I keep thinking right now. lol maybe he was getting paid by the letter or maybe it was a cruel prank by his friends.